Closing parties, beach parties, birthday parties, private parties, album launches and fashion shows – to say there was a lot going on in Ibiza last week would probably be the world’s biggest understatement! 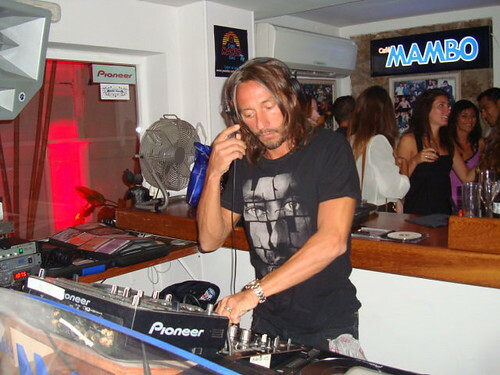 But despite some of the huge events taking centre stage this week, there was one event that (in Miss W’s eyes) really stood out among the rest: the Café Mambo pre-party for Defected in the House, starring none other than French house maestro Bob Sinclar. Arriving at the iconic San Antonio sunset strip location at the perfectly polite time of ten-minutes-before-sunset, to catch the view that truly never gets any less spectacular no matter how many times you see it, Miss W was ushered to the ultimate front row seat, in the VIP section directly in front of the DJ booth, having been invited to join the Defected crew for their very last pre-party dinner of the summer. Perched on the end of a v-e-r-y long table indeed, it did have the feel of a last supper, as we were all anxiously awaiting the arrival of our long-haired hero to spin the suppertime set. 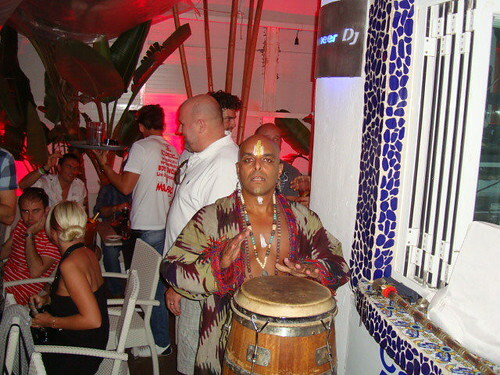 The Mambo team were bedecked in cute ‘I ♥ Bob’ t-shirts, while Defected’s drum warrior Shovell was bedecked in his signature kaftan, war paint and eye liner, a thin line of smoke from his incense sticks wafting after him wherever he walked. Then as the Frenchman du jour (who hasn’t aged a bit in around ten years!) arrived, it was cameras a-blazing and hierbas a-flowing, as the party kicked into a new gear. Christian Anadon, Bex Pawsey & Tillie Wood heart Bob! Proving once again why he really is the French house DJ of choice for true music lovers (F*** Me, who’s famous again?? ), Bob Sinclar took the up-for-it audience through decades of eclectic musical stylings, sometimes through original versions such as Van McCoy & Soul City Symphony’s Do The Hustle, UB40’s Red Red Wine, an amazing remix of Chris Isaak’s Wicked Game, Bob Marley’s Get Up, Stand Up, and super cool downtempo covers of tracks like Cyndi’s Lauper’s Girls Just Wanna Have Fun and Sinead O’Connor’s Nothing Compares to you (what a finale!). Think salsa, Cuban, reggae, disco, chillout, alternative – anything and everything expertly fused together for the most perfect pre-party set I have ever experienced. If anyone happened to record it… well, you know where to find me! Tonight, for the first time in, well, quite a while to tell you the truth, I no longer felt like one of those seen-it-all-before Ibiza types – I really felt a buzz in the air and a new energy, as I embraced the entire Café Mambo experience from cocktails at sunset, to dinner and the pre-party build up. It was the authentic feeling, dear readers, that you read about in Mixmag, that they rave about in the Sunday Times, the spirit of Ibiza that cynics say is gone for good. I’m here to tell you, it was right there at Café Mambo – perhaps, like Dorothy in the Wizard of Oz, I never lost it in the first place, I just forgot where to look. 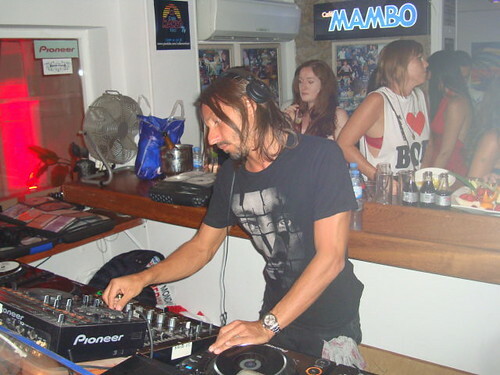 THE GOOD: This is what superstar DJ sets at Mambo should be all about! I know I’m not only speaking for myself when I say I relish the chance to see a famous DJ play an eclectic set, and for all of the island pre-parties, a venue like Mambo provides the perfect platform for them to do this, though sadly, many of the special guests just come in and bang out the same club tunes they’ll be playing at 3am that night (please take note Laidback Luke, Erick Morillo and Deadmau5). A standing ovation to Monsieur Sinclar then, who had even requested a longer, two-hour set time in which to entertain us with his alternative music collection. I couldn’t have said it better than the promo t-shirt – I ♥ Bob! THE BAD: Me. It was totally my bad this time. After having such a lovely evening at Café Mambo with the Defected crew, Miss W was a tad chilly so decided to go home and get changed before heading to Pacha for the closing party. Where, upon sitting on the couch and having a little snuggle with the cats, I promptly fell asleep. Sorry Defected! What can I say – it’s the end of the season, and I guess we all need to catch up on a little sleep by now. THE GOSSIP: A certain ‘Mambo brother’ was very hesitant to part with an ‘I ♥ Bob’ t-shirt for Miss W, but despite his insistence that I must wear it on the night (err, sorry, but it just didn’t match my shoes!) for promotion in order to be bestowed with it, I somehow managed to use my powers of persuasion to be able to take one home with me to customize. If only he could see me now… seriously!